Now, I have to admit that Facebook prompts don't usually trigger me to act. There was something a little more provoking about this one though, so I felt compelled to answer. I answered that my mom inspires me. She was faced with a lot of loss and adversity early on in her life and still managed to raise seven of us kids. She is still active in the community as a worker/volunteer and has a great friend group - all of which I think plays an important part in having a healthy senior life. But there are lots of others that inspire me too. I'll just touch on a few. Men and women in their forties, fifties and sixties who are actively writing. The same goes for those doing art, or trying to master an instrument. I favor this group for obvious reasons, but I just think it's so cool that people at these stages of life still see themselves as worthy contributors to the art world. Granted, most of them are probably doing it because they enjoy it - some with a goal of getting published, but some not. The point is not why they are doing it, the point is that they're doing it despite not having to do it. To me, people like this are the five percenters. They are driven to something bigger than themselves. This is admirable and inspiring. Foster and adoptive parents. Anyone who is selfless enough to take on someone else's kids, whether short term or permanently, I have great respect for. They make me feel like I'm not doing enough - which is probably true. But they inspire me nonetheless. Musicians. Any and all. 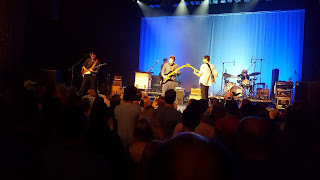 Tuesday night I saw the band Dawes, and was floored by the amazing talent of each and every member. These guys can sing, song write and, in many cases, play multiple instruments. So I admire them all, mostly because I could never master an instrument. (I may be tone deaf, but that is no excuse.) I took guitar lessons for a few weeks and gave up when my friend gave up. It's one thing I wish I'd kept pursuing. It still might be something I pursue in my retirement. Know any geriatric bands who need a bassist? High School kids who are taking multiple Advanced Placement courses. The same principle as above applies here. These kids are for the most part not required to take these more difficult courses. But when they do, and they do well in them, well, it's even more impressive. Many of these kids take them because they like to push themselves to excel. Admirable for such a young age. Bands that keep on rockin' into their 60's and 70's. Lots of people think rock music is for the young and that any rock star over 50 should not be doing it anymore. I beg to differ. I think if you like something, and you're good at it - and many of the old rockers are - go for it. Roger Waters on Saturday was proof, as I suspect Stevie Nicks will be when I see her in September. Why wouldn't you stop doing something you're very passionate about? If you're good, people will follow - because they're fans, but also because they're inspired. That's just a sampling of people who inspire me.